Taste the fruit, not the fish, and get more Omega-3s, too! No. Fish. Burps. We know it’s is hard to believe, but when we say no fish burps, we mean no fish burps. Really. Want some more good news? 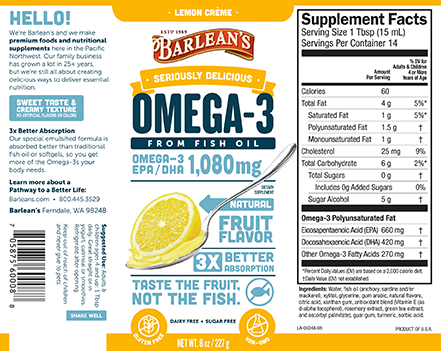 The taste and texture of Barlean’s Lemon Zest Omega Swirl® is so delicious that kids ask for their fish oil. In fact, Omega Swirl® is a family favorite in the autism community for that reason. A few other important things about Barlean’s Omega Swirl®: just two tsp provide an adult serving of 720mg of Omega-3 EPA/DHA. Omega-3s are essential fatty acids that cannot be produced by the body, so we need to get them from foods or supplements. And because it’s emulsified, you absorb 3X more Omega-3s per spoonful than with standard fish oil or softgels. It’s also free of mercury and other heavy metals. And with a fresh lemon meringue pie flavor that people of all ages love, it doesn’t get any easier to get your daily dose of Omega-3s.